Starting Monday, we will begin a trip 13 years in the making. This journey is one of the pivotal events in my life, and each day leading up to it my excitement and anxiety about it build. I moved to America over 13 years ago from Poland, and have not been back since. This is the first time that I will see my home country since our immigration. At first I could not leave the US because of citizenship process restrictions. After I became a permanent resident, I could have technically traveled, but other issues added risk to doing so. First, the political climate in the US has been strained since 9/11. I did not want to risk traveling without a US passport. Additionally, even now you still have to apply for a visa if traveling from Poland to the US. I would have had to do so if in the possession of a Polish passport, without any guarantees that I would even get a visa. All of those factors combined influenced my decision to wait until I became a naturalized citizen. With that out of the way almost two years ago now, I was able to get a US passport and start saving money for traveling to Poland. Now that time is so very very near, just a few days, and it is still hard to believe. After you wait for something 13 years, it doesn't seem real even when it is finally and actually about to happen. Very soon, we will be on a plane crossing the Atlantic, and then a wonderful month of absorbing the culture I have missed for so long awaits. I look forward to so many things, like seeing my grandparents, aunts and uncles, and cousins and friends. 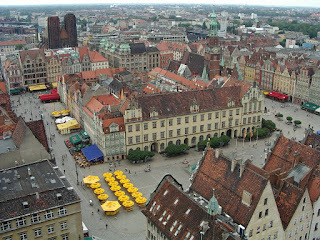 I also look forward to simply being in my home country, in my home city of Wrocław, and of course the food! I shall bring back more pictures than I'll know what to do with, and subject everyone I know to them. So, ha! Better watch out. Oh yeah, maybe I'll bring back some gifts, too. Just maybe. However, be forewarned that this means I'm not likely to be very communicative during the next two months. Though I will still get some posts up in draft so I can blog our journey when I get back.